Fiction can be a powerful vehicle for speaking truth into a person's life. 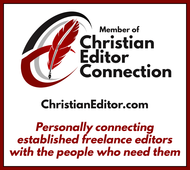 My role as editor is to ensure that your story is told to the reader in the most effective and meaningful way and to help you develop your craft. Our imaginations are a gift from God, and those particularly gifted in storytelling can reach some of us in ways that others might not. For those of us who have a penchant for dreaming and wondering, I want to facilitate the storytelling that we so desire and that can speak to our deepest spiritual longings. I also want to facilitate storytelling that entertains us while honoring our Savior. If I do my job well, the reader won't ever notice me in the shadows of your inspired story. 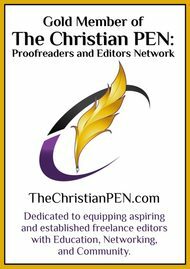 Through my work and passion, I hope to connect readers with amazing stories told by Christian fiction authors. Send me your first three pages so that you can assess my work and determine if I would be right for your project.